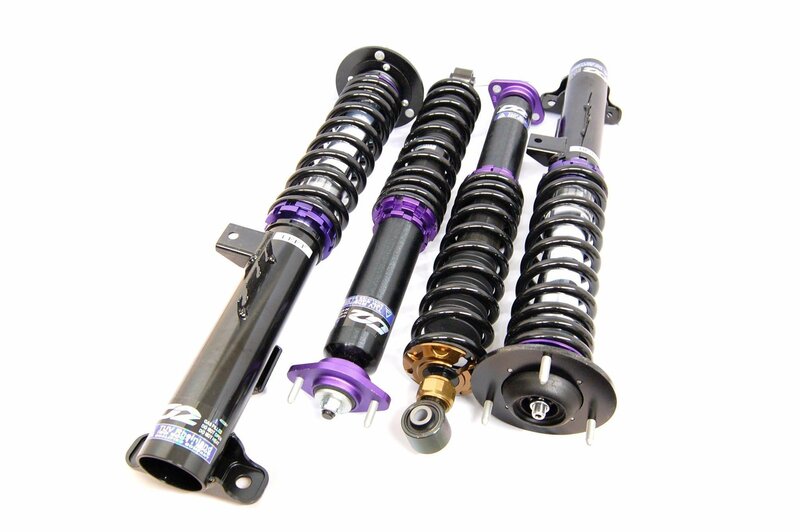 Height- and damping adjustable coilover suspennsion kits for all-year use with 2-year warranty. D2 suspension kits are road legal as well. Price (incl.vat) 0.00 - 0.00 € / pcs ✔ Delivery time 10 - 15 working days. ✔ In stock. 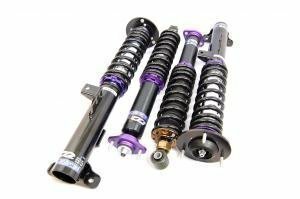 Also excellent in cold winter conditions, the D2 coilovers come in a few different versions from which the Street -series is the top seller due to its adjustability yet reasonable price. For competition purposes, there are other versions which are covered further on. 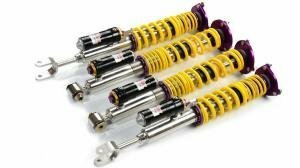 The kits offer full adjustability on height, spring preload, damping and camber on McPherson models. The delivery contents, simply put, include four struts like in the pictures. 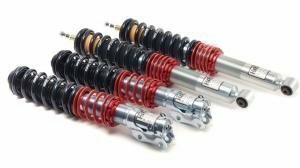 Take the old off and bolt on your new coilovers, that easy! Height is adjusted by moving the lower mount. The spring preload and damper position doesn't change, so damping is always optimal. Height adjustment is between -100 to stock height. 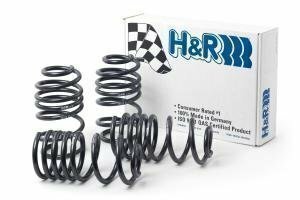 Spring preload is used to fine tune the suspension and corner weights. Adding spring preload also makes the kit a bit stiffer if needed. Allthough shimmed per car, a 36-step damping adjustment is present. The adjustment lets oil flow around the piston, and effects how stiff the kit is. Most cars with McPherson front suspension have adjustable uniball topmounts. Camber is easy to set, and can be set to the correct angle even on highly lowered models. Spring bearing: The front spring has a bearing. Materials: Threads teflon coated, lower mounts and topmounts anodized aluminum or powdercoated steel. McPherson struts with 55mm body! A suspensions which offers just the right amount of traction. 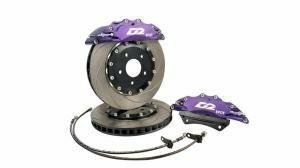 Drifting a car requires lots of traction, but the time and place of traction need to be precisely controlled - this is where the D2 Drift kit comes in the picture. The rally gravel series has been developed for, what else than gravel rally. 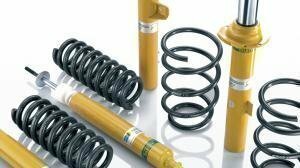 This is the second top seller of the D2 suspension, so it has already been well proven in the Finnish rally paths. Materials: Threads teflon coated, lower mounts and topmounts anodized aluminum or powdercoated steel. Are you driving rallies on tarmac? This is the kit for you! Add some swaybars and your car will go through the apexes like a missile! The circuit set is perfect for some fast track driving. If youre attacking time, this kit is the one for you. Spring bearing: Front top perch has a bearing. The dragracing sets are made for super fast launches in mind. Be prepared to give more information about your car, as these sets are tailormade for every car! Ask for more information, there is a lot of it! Installation is as easy as any bolt-on kit comes. Take the old one out and put new coilovers on. Our installation / guides -section contains more information on how to install and adjust your kit. D2 kits are covered with a 2-year warranty on manufacturing defects. 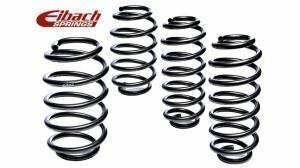 If you're not satisfied with the spring rates, we allow changes to other available springs within 60 days of purchase, charging only shipping costs. All spare parts are available separately after purchase, and can be ordered directly from our webshop. D2 coilover kits are fully road legal in Finland. We will write the needed approval on request. You will also need a wheel alignment certificate from any garage for inspection and our office in order to write the approval. Read the Finnish Trafi vehicle inspection directions here. The inspector has to comply with the Trafi inspections. Trafi inspection instructions (Avautuu uuteen ikkunaan).